Always a benevolent giver when it comes to his music, Mellow Orange beatmaker Freddie Joachim has compiled an assortment of originals songs and recent remixes to gift to his fans in the form of his latest compilation project, The Joachim Remixes Vol. 5. The compilation features several remixes which were featured on past unofficial compilation, Overture, as well as notable remixes showcased here on EARMILK such as reworks of songs by Q-Tip and Corinne Bailey Rae. In addition to the the previously featured songs, the 19-track compilation features reworks of music from the now defunct neo-soul duo Floetry, living legend Stevie Wonder, veteran Brooklyn rapper Talib Kweli and a smooth original instrumental cut titled, "Sweep Away My Sorrow". Freddie Joachim's anticipated album Fiberglass Kisses, is scheduled to be released this summer and will feature guest appearances from Miles Bonny, Mar, L. Santiago, Carlitta Durand, and J. Mitchell. Until then, enjoy the sounds of his new remix compilation. 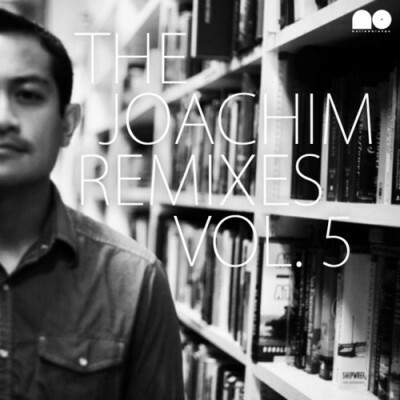 Also, for your convenience the The Joachim Remixes Vol. 1-4 (remixes produced from 2004-2008), are available for download HERE. Warm your soul Aris P's "Personal Goals"